Home|Floral Library|Pigtail Anthurium – Anthurium scherzerianum and A. spp. Decorative Life: Many weeks to months depending on interior environment. Should be grown under reduced light intensities so they will be better acclimated to subsequent interior environments. Store at 55-66F as this species is chill sensitive. Flowers will turn gray to blackish when exposed to temperatures below 50F. Does well if transported or stored for only 3 days or less at 50-80F. The flower consists of a wiry, leafless stem bearing at its end a flat heart-shaped spathe from 1-2 inches across. Classified as “epiphytes” or air plants as they grow on other plants and elevated supports. They are not parasites but obtain water and nutrients through a spongy covering of their roots. The actual flowers occur on a columnar structure called a spadix that protrudes 1 to 3 inches out from the middle of the spathe. Spadix maturity (number of open flowers) is determined by the degree of roughness. 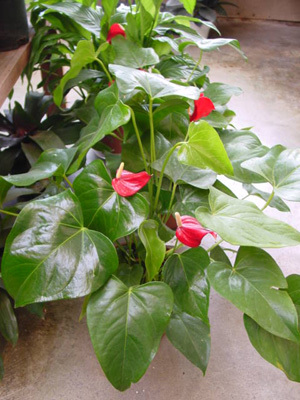 This and other anthurium species are also grown for their foliage. Thus, they look good even when not flowering. Another potted plant relative of this species has the common names of White Anthurium and Peace Lily but is a different genus, Spathiphyllum. Chen et al. (1999) showed that Anthurium plants can perform well under low light levels in the home or office but this response is cultivar specific with ‘Red Hot’ doing the best.